Has your Pierce genealogy research hit a brick wall? Has the paper trail found in courthouse basements lead to a dead end? If so, you may wish to take advantage of today's cutting edge DNA technology to jump start your research. Participation in the Pierce DNA project is simple. Please use this "Join" link and complete a "Pierce Project Join Request." 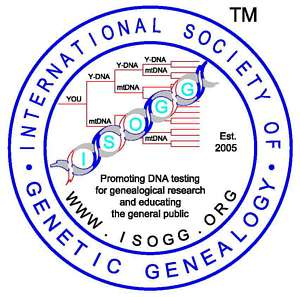 After the request is received, participants will be sent a form to join this group and complete an order for one of the following tests: the YDNA-12 marker test ($59), the YDNA-25 marker test ($109), the YDNA-37 marker test ($149), or the YDNA-67 marker test ($248). Participants are encouraged to select at least the YDNA-25 marker test because the results are more helpful in identifying matches with other participants. For any interested new U.K. participant, this project is currently offering to pay for a 37 marker test. Participants must be male Pierces because the genetic information tested (on the Y chromosome) is passed along the male line from father to son. If you are a Pierce, but are female, you will need to recruit a male Pierce relative-- perhaps a cousin, father, brother, or uncle to participate. The tests are done by Family Tree DNA located in Houston, TX. Family Tree DNA's website has a wealth of information about the use of DNA analysis in genealogy. For additional information, please see their Frequently Asked Questions page. If you have any further questions, please do not hesitate to use our Contact Us form to email the group administrator. Thanks for visiting the Pierce DNA Project, Southern U.S.
Don't forget to check our sister website!